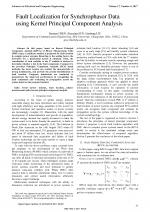 CHEN, R. , SUN, X. , LIU, G.
In this paper, based on Kernel Principal Component Analysis (KPCA) of Phasor Measurement Units (PMU) data, a nonlinear method is proposed for fault location in complex power systems. Resorting to the scaling factor, the derivative for a polynomial kernel is obtained. Then, the contribution of each variable to the T2 statistic is derived to determine whether a bus is the fault component. Compared to the previous Principal Component Analysis (PCA) based methods, the novel version can combat the characteristic of strong nonlinearity, and provide the precise identification of fault location. Computer simulations are conducted to demonstrate the improved performance in recognizing the fault component and evaluating its propagation across the system based on the proposed method.